This unique linen deluxe consists of 53% polyester and 44% wool. Polyester feels soft and natural, is lightweight but strong and elastic. Because the fabric contains polyester, it will not shrink quickly and the fabric remains dimensionally stable. 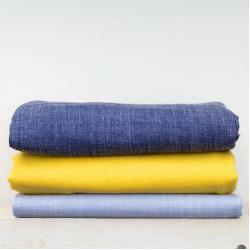 The wool in the fabric makes this linen look nice and warm and naturally has a high elasticity. The substance naturally returns to its original shape, the 3% lycra also helps a little bit. This luxurious fabric is suitable for making casual wear, shirts, blouses, skirts and curtains. Quality: Polyester - Wool - Lycra (53% - 44% - 3%)Width:150 cmWeight: 190 g/m2Product code: 4465022..
Quality: Polyester - Wool - Lycra (53% - 44% - 3%)Width:150 cmWeight: 190 g/m2Product code: 4465002..
Quality: Polyester - Wool - Lycra (53% - 44% - 3%)Width:150 cmWeight: 190 g/m2Product code: 4465102..
Quality: Polyester - Wool - Lycra (53% - 44% - 3%)Width:150 cmWeight: 190 g/m2Product code: 4465015..
Quality: Polyester - Wool - Lycra (53% - 44% - 3%)Width:150 cmWeight: 190 g/m2Product code: 4465003..
Quality: Polyester - Wool - Lycra (53% - 44% - 3%)Width:150 cmWeight: 190 g/m2Product code: 4465014..
Quality: Polyester - Wool - Lycra (53% - 44% - 3%)Width:150 cmWeight: 190 g/m2Product code: 7283013..
Quality: Polyester - Wool - Lycra (53% - 44% - 3%)Width:150 cmWeight: 190 g/m2Product code: 4465004..
Quality: Polyester - Wool - Lycra (53% - 44% - 3%)Width:150 cmWeight: 190 g/m2Product code: 4465023..
Quality: Polyester - Wool - Lycra (53% - 44% - 3%)Width:150 cmWeight: 190 g/m2Product code: 4465024..
Quality: Polyester - Wool - Lycra (53% - 44% - 3%)Width:150 cmWeight: 190 g/m2Product code: 4465012..